Your client has been approached by a past employer offering a limited-time opportunity to receive his pension as a lump sum. The pension is not normally accessible at his age and the lump sum is not offered, even when he’s older. He wants your advice on whether he should take the lump sum now or wait to get a monthly benefit because it’s a “sure thing”. Click below for a replay of our recent webinar! Your client has the chance to take control of this asset and, with focused guidance from you, make that asset more valuable over the long run than his former employer can supply. These offers are made to thousands of people at a time. You have the opportunity to improve the longevity and stability of income for your client through an annuity and build or strengthen this relationship. If you do right by this client, he will gladly refer his friends to you as well. He will come back to you when it’s time for him to retire from his current employer, too. You know that today’s workforce can’t count on a pension like the prior generations. Companies have been on a long-term path to reduce liabilities, and this is step two in a three step trajectory. Every person who takes this offer is a positive for the employer because the costs of administration and statutory insurance on this pension plan go away – expenses which are only increasing. Employers only expect 55-65% of those offered this chance to take it. What they have in store for the rest can be pretty scary for your client. The remaining folks are going to have annuities purchased for them – the company rids themselves of the liability and signs a contract with an insurance company who becomes the fiduciary. It’s no longer government-backed. The choices available for survivor benefit levels is far fewer and your client is kept informed, but unable to have a hand in any of the decisions about who holds their money. Once this lump sum window ends, so goes the chance to have input. To help drive that take rate, employers have some tricks up their sleeve to make the lump sum more generous. They might subsidize the early retirement factor (ERF), or tack on an extra benefit that is only available later, like a Social Security early retirement supplement. If your client is so fortunate to have been grandfathered into a COLA, it’s likely represented in the lump sum, too. When you’re looking though the 30 pages of materials that they received, it’ll be tricky to find how the present value is being determined. The most common design is to go with mortality and interest assumptions called 417(e) with a November lookback. Want that in English? 2015 payouts will assume mortality of everyone, regardless of gender and health status, of about age 83. The interest rate is about 3.3%. We want to provide the client with a full understanding of their options and how it impacts their plan. Ultimately, we will walk the client through their options side-by-side, under different market conditions. There's nothing more impactful than showing a client how their plan performs under stress! Plug in the values of the annuity as retirement income. In the first estimate, use the 50% joint and survivor amount payable now. In the second estimate enter what is probably labeled “accrued benefit” – the full benefit before reduced for early payment. Enter a 50% survivor benefit for a married client. Enter 0 for an unmarried client. Copy your plan to model the alternative of taking the present value lump sum and purchasing an annuity through you. Name it Lump Sum Annuitized. In the Pension Lump Sum plan, delete the pension from the Retirement Income and add the lump sum as an asset instead. Specifically, put it in as qualified assets in an IRA account type for now. Name it Pension Lump Sum. Use Compare It to put that lump sum into an annuity, say the Indexed Annuity with Increasing Income, with a joint life rider and increasing Income Option 2. 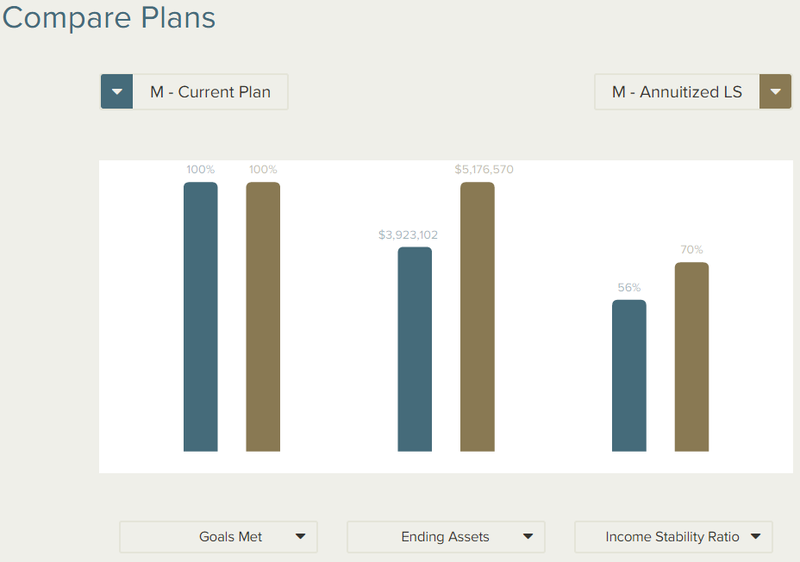 The Compare Plans feature will help you illustrate some of this to your client, who we’ve assumed is married. Let’s look at a variable return model and stress it. Your annuity is out-performing the company-provided annuity, even under a negative sequence. 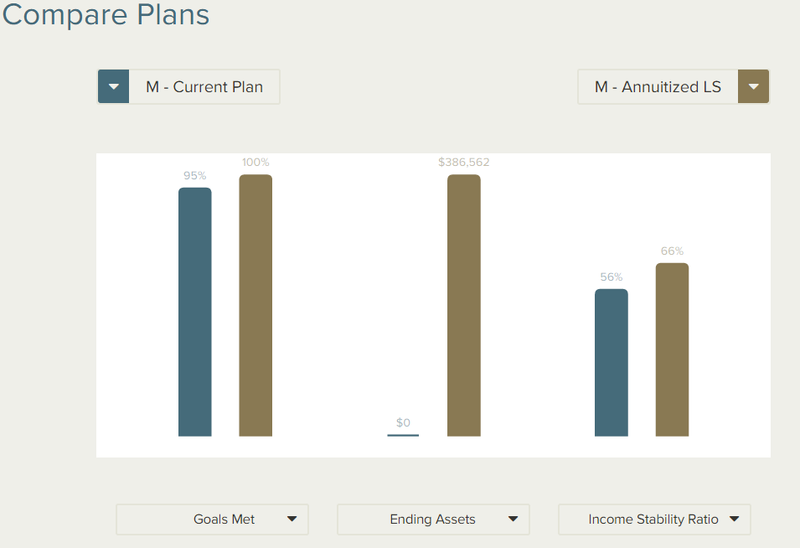 The Current Plan of going with the “sure thing” results in a shortfall late in life, as shown in zero ending assets. 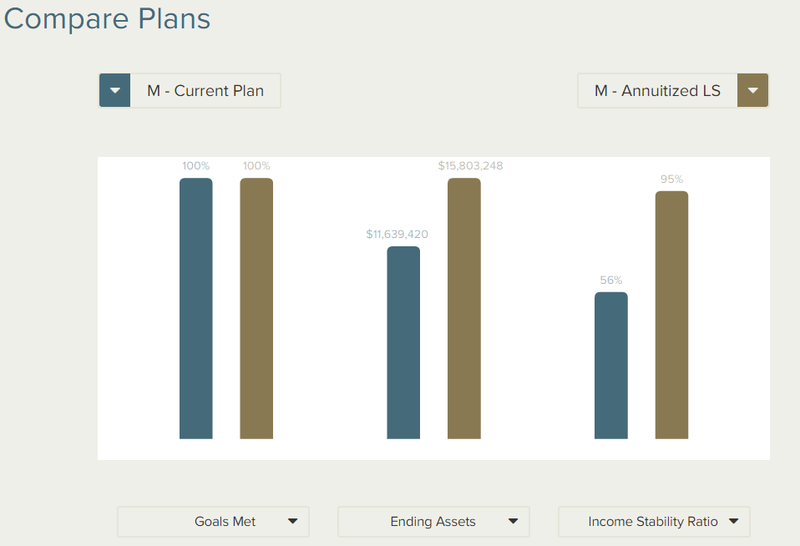 More realistically, if we compare these paths under an average sequence, both options alleviate a shortfall as shown in 100% of goals met, but the ending assets and Income Stability Ratio are dramatically improved by annuitizing with you. Your client can spend more on the fun parts of retirement because there’s more than a million in cushion. Hey client, go ahead and get that sports car, and schedule a tee time for the Old Course at St. Andrews – you’ve earned it. If the stars are in alignment and the return is affected by a positive sequence, he will have more than $15M in ending assets. Your client will be chartering a private jet to his golf game and taking you along for the trip. Pro tip: let him win.